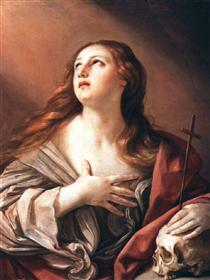 Guido Reni (Italian pronunciation: [ˌɡwiːdo ˈrɛːni]; 4 November 1575 – 18 August 1642) was an Italian painter of high-Baroque style. 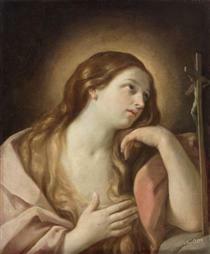 He painted primarily religious works, as well as mythological and allegorical subjects. 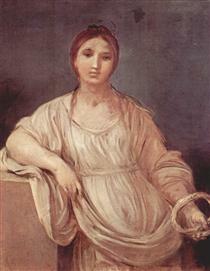 Active in Rome, Naples, and his native Bologna, he became the dominant figure in the Bolognese School, and his eclectic classicism was widely influential. 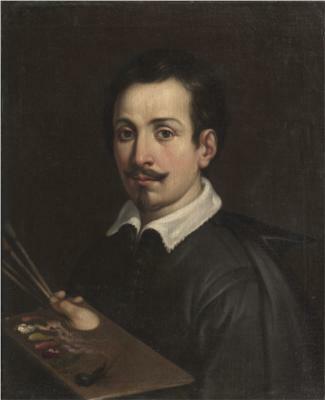 Born in Bologna into a family of musicians, Guido Reni was the only child of Daniele Reni and Ginevra Pozzi. 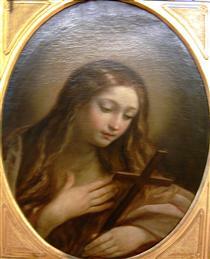 At the age of nine, he was apprenticed to the Bolognese studio of Denis Calvaert. 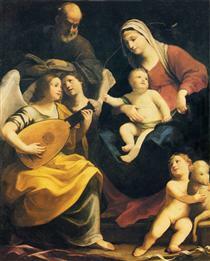 Soon after, he was joined in that studio by Albani and Domenichino. He may also have trained with a painter by the name of Ferrantini. 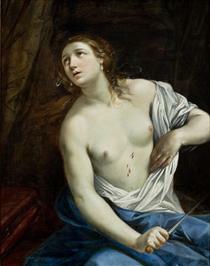 When Reni was about twenty years old, the three Calvaert pupils migrated to the rising rival studio, named Accademia degli Incamminati (Academy of the "newly embarked", or progressives), led by Ludovico Carracci. 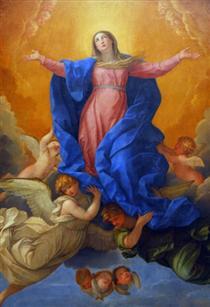 They went on to form the nucleus of a prolific and successful school of Bolognese painters who followed Lodovico's cousin Annibale Carracci to Rome. 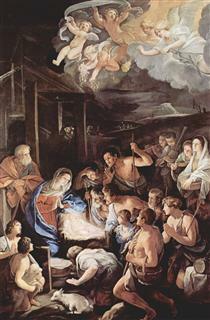 Reni completed commissions for his first altarpieces while in the Carracci academy. 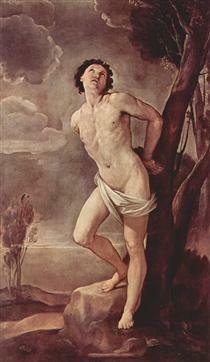 He left the academy by 1598, after an argument with Ludovico Carracci over unpaid work. 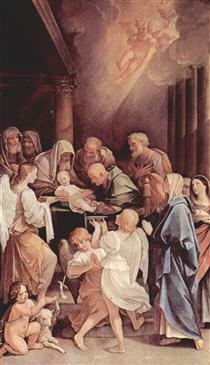 Around this time he made his first prints, a series commemorating Pope Clement VIII's visit to Bologna in 1598. 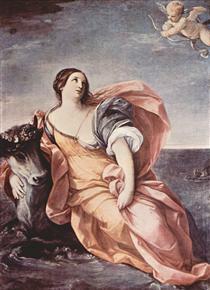 By late 1601, Reni and Albani had moved to Rome to work with the teams led by Annibale Carracci in fresco decoration of the Farnese Palace. During 1601–1604, his main patron was Cardinal Paolo Emilio Sfondrati. 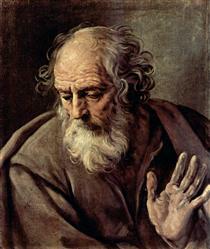 By 1604–1605, he received an independent commission for an altarpiece of the Crucifixion of St. Peter. 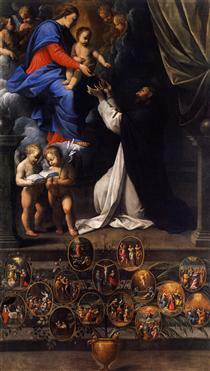 After returning briefly to Bologna, he went back to Rome to become one of the premier painters during the papacy of Paul V (Borghese); between 1607–1614, he was one of the painters most patronized by the Borghese family. Reni's frescoed ceiling of the large central hall of the Casino dell'Aurora, located in the grounds of the Palazzo Pallavicini-Rospigliosi, is often considered his masterpiece. The building was originally a pavilion commissioned by Cardinal Scipione Borghese; the rear portion overlooks the Piazza Montecavallo and Palazzo del Quirinale. The massive fresco is framed in quadri riportati and depicts Apollo in his Chariot preceded by Dawn (Aurora) bringing light to the world. 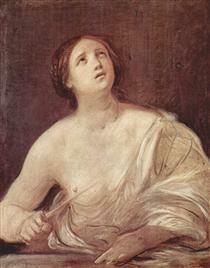 The work is restrained in classicism, copying poses from Roman sarcophagi, and showing far more simplicity and restraint than Carracci's riotous Triumph of Bacchus and Ariadne in the Farnese. 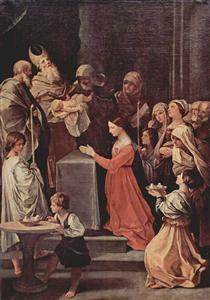 In this painting Reni allies himself more with the sterner Cavaliere d'Arpino, Lanfranco, and Albani "School" of mytho-historic painting, and less with the more crowded frescoes characteristic of Pietro da Cortona. There is little concession to perspective, and the vibrantly colored style is antithetical to the tenebrism of Caravaggio's followers. Documents show that Reni was paid 247 scudi and 54 baiocchi upon completion of his work on 24 September 1616. 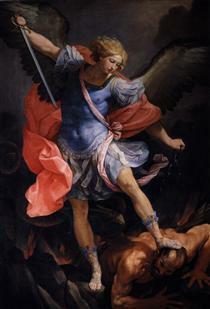 In 1630, the Barberini family of Pope Urban VIII commissioned from Reni a painting of the Archangel Michael for the church of Santa Maria della Concezione dei Cappuccini. 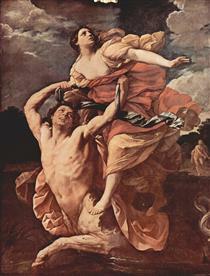 The painting, completed in 1636, gave rise to an old legend that Reni had represented Satan—crushed under St Michael's foot—with the facial features of Cardinal Giovanni Battista Pamphilj in revenge for a slight. 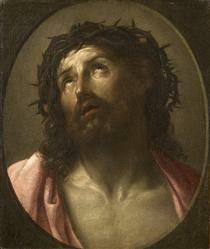 Man of Sorrows Guido Reni ?